From genetics to YouTube, innovation requires the right environment and the component parts to be available. YouTube required broadband and Flash for an internet video service to be viable and developed in a very short period of time. Innovation thrives on connections, from the primordial soup to the bars and coffee shops of the Scottish Enlightenment (Johnson uses the Italian cities of the Renaissance as his example). 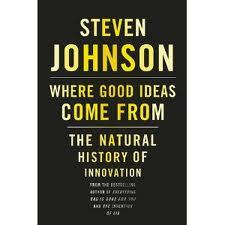 The evidence support the incubation of innovative ideas over time rather than the one-off Eureka moment. Luck has a part to play but you often make your own luck. Fleming’s discovery of Penicillin through a contaminated experiment is one of the classics. One of the mantras of the web is ‘fail faster’. Failure is inevitable, what’s important is the learning that is gained along the way towards success. The idea that the function of something may change over time or be adopted/co-opted to serve a completely different end. Just think about the US military communications network ARPANET which was designed to have no single point of failure but led to the design for the internet. From the coral reef supporting the planet’s most diverse eco-system to the innovative jazz of Miles Davis relying on the D Dorian scale and the invention of the valved trumpet. Finally he categorises innovation across the axes of market/non-market driven v individual/networked and makes a compelling case that innovation has become increasingly a networked rather than an individual phenomenon. He also argues for the increasing importance of what he calls the 4th quadrant, non-market/network, when it comes to innovation. Very good read from a very thoughtful and insightful writer. This is a well researched book that offers deep insights into our modern world, not only how many of the things we take for granted were invented but just as importantly where the next innovations might come from.